I am the quintessential Christmas queen! I start to think about the season wistfully in October. In November, the decorations come out, the carols are being sung, I start my holiday shopping and our schedule begins to get that much more hectic. I host Christmas parties, bake cookies and cakes, wrap presents ornately while watching Lifetime Christmas movies... We really, really immerse ourselves in the season. And like most parents, I work hard to create beautiful Christmas memories and meaningful holiday traditions for my kids. That being said, I have begun to struggle with how insanely commercial Christmas is becoming. Isn't the season supposed to be about peace and earth and goodwill towards men? Don't get me wrong, I enjoy giving thoughtful presents and I love my presents on Christmas morning.... but is that all that it's about? Even though, we're not Christian, I want my children to understand the meaning of Christmas and appreciate the season. And I don't want to spoil them. I really limit the amount of presents that we give them, they usually get one nice toy from us and one high end item from Santa (or a couple if no one high end item is on the list). Then they get from the grandparents, some stuff from aunts and cousins, some things from friends and even though we limit it(giving people a budget and asking them to buy only one or two items), it usually winds up being a lot of stuff. This is why this year, as one of our Advent activities, we went through our old toys and got rid of a huge bag of things even before the season truly begins. 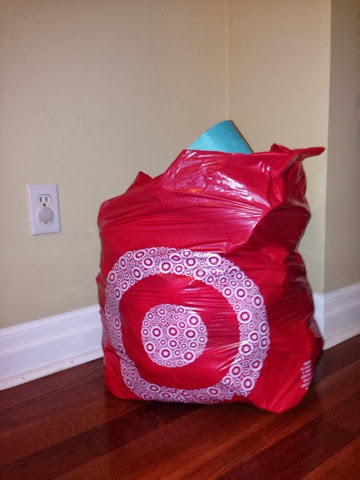 Doesn't look that way, but this is the size of a garbage bag. Growing up in Trinidad, we didn't get a lot of stuff for Christmas. Santa would get us something and maybe a couple family members. But what I remember most about the holiday season was all the getting together with family, getting to watch cable tv at the one uncle's house who had it, getting on the swings at maybe it was the same Uncle's house, all the delicious food (and way too much sugar) and all the great conversation the adults had. I really cherish those memories and want my kids to have that... but then now in Trinidad, speaking to family and friends, the commercialisation is creeping in and kids are beginning to expect all these presents.... aaargh!!!! So what are we to do? Well, each night as part of our Christmas advent activities, we do something Christmas themed. The focus is spending time together. We'll be reading stories, colouring, carolling, doing crafts and watching Christmas shows together. This year we're doubly blessed as both sets of grandparents will be around for Christmas so lots of fun for the kids. We're also going to be making things for friends, family and neighbours so that Cass understands how good giving feels. We're also trying to instil generosity in our kids by great projects such as Operation CHristmas Child, donating old toys, books and clothes and giving to food and toy drives. On Christmas mornings, I want my children not to think "look how many things I got" but rather "look at how blessed I am." Maybe not this year as that's a tall order for a four year old and a one year old, I know.... but we will continue to try to get there.